AxCMS.net provides an export interface for nearly all cms objects. Please read here for a description of export possibilities. This following diagrams are mainly about pages content export and import but also provide some more detail description about export functionality. The BaseImporter contains import functions that are related to many cms objects, like importing properties, category assignments and relations. The PageImporter itself extends the BaseImporter functionality especially for importing the content of a page. It can be used to import pages, newsletters and mailtemplates. The ImportException is an exception type especially created for import so that those exceptions can be excluded in web.config from being published. The ImportInfoException is an special exception type to pass information to the user but this information is not published. The ContentXMLImmutableAttribute can be used for properties in your page class. If a property has this attribute, the value from xml import file is not set (e.g. Created, Published…). IExportSerializer is general interface for all export possibilities in AxCMS.net. 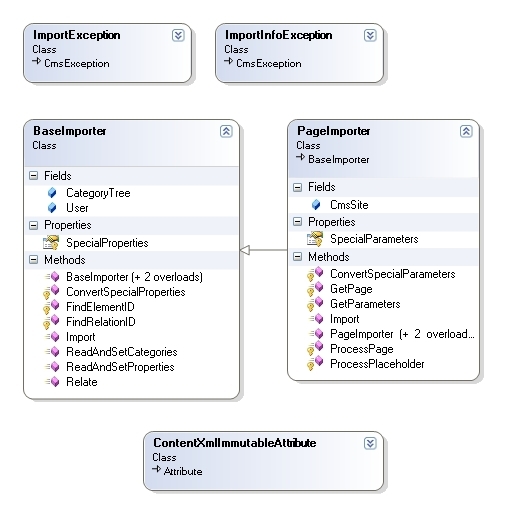 In class BaseContentSerializer all methods are located that affect more than one cms object. There is all functionality about categories, relations, property setting inside. 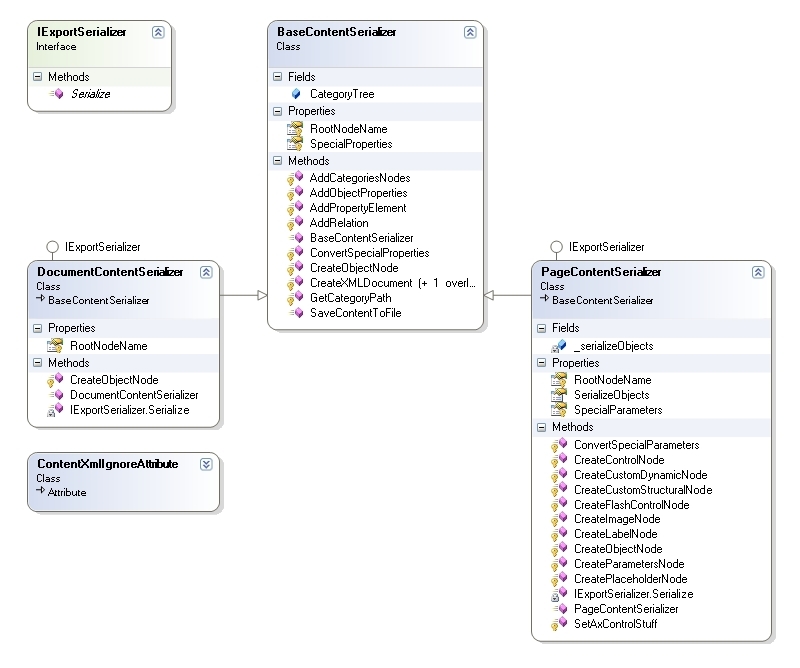 PageContentSerializer contains all methods that are needed to export also the content which is on a page. ContentXmlIgnoreAttribute can be used to avoid that certain properties get exported.